Saudi Women's Vote: Does it Go Far Enough? Saudi Women’s Vote: Does it Go Far Enough? The surprise announcement on Sunday by King Abdullah of Saudi Arabia that women will be allowed to vote in and run for office in the municipal elections scheduled in four years is another sign of the pressure the kingdom is under to reform. Although this announcement wasn’t anticipated, it comes as a result in part of nearly a decade of women’s activism, beginning with a January 2003 petition from Saudi women demanding their political rights. The recent Facebook campaign for driving rights for women, and the act of civil disobedience by some 80 or so in daring to drive, probably helped impel the king to make this decision. Treatment of women in Saudi Arabia has much more to do with Gulf customs and feelings about gender segregation and male honor being invested in protecting the chastity of the family’s women than it has to do with Islam. The Qur’an sees women as spiritually equal to men. One of the prophet’s wives later led a battle, so women in early Islam were hardly shrinking lilies. Islamic law gives women extensive property rights (unlike in Europe, women did not lose control of their property to their husbands when they married). The real question is whether the Gulf societies can, after 1400 years, catch up to the rights granted women in Islam. An even bigger question is whether the Saudi dynasty, among the last absolute monarchies in the world, is moving fast enough to avert a revolution. This article is a few years old, but it lays out many of the social problems that persist to this day. There are just few safety valves for discontent. Workers cannot unionize. Political dissidents are treated harshly. That fear is one reason that they intervened so heavy-handedly in the affairs of neighboring little Bahrain, where crowds were demanding constitutional reform (and a minority was even insisting on a revolutionary republic). While the Shiite coloration of the crowds in Manama especially worried Riyadh, that there were massive crowds challenging the king was alarming enough. (Saudi Arabia has its own relatively oppressed minority of Shiites, some 12 percent of the population, who are inconveniently located right above the country’s oil deposits). In March, King Abdullah offered a big increase in social benefits and bonuses to a wide cross-section of the population, a move widely interpreted as an attempt to bribe Saudis into staying home and not going to the streets in protest. This new benefits package cost so much money (an estimated $38 billion a year) that the Saudi state is estimated to now require that petroleum stay above 90 dollars a barrel to avoid big budget deficits. Since the kingdom is a swing producer, it can affect the price by reducing exports (and because of the consequent rise in prices it would not even necessarily suffer a shortfall in income if it did so carefully). That is, keeping the Saudi public happy is costing you at the pump. Giving the vote to women may be part of this attempt to tamp down dissatisfaction with the state. The royal family has fought against Muslim radicals since May of 2003, when the al-Qaeda in the Arabian Peninsula began blowing things up in Riyadh itself, and Muslim political currents to the right of the king (yes, it is possible) have put political pressure on him. We have seen a number of attempts in the region to dilute the power of Muslim fundamentalists by using women voters and office-holders. Gen. Pervez Musharraf set things up so that a third of seats in the Pakistani parliament have to go to women. There is also a quota in Iraq. The hope that women (or rather the sort of middle or uppper class women most likely to serve in parliament) will support political reform and oppose religious fundamentalism is not always well borne out. In Pakistan and Iraq, the parties simply put women of their party into parliament, who tended to vote just as patriarchally as the men of the fundamentalist party. Nor does the right to vote in municipal elections four years down the road in Saudi Arabia amount to all that much. The royal family only allows half the seats on the city council to be filled by elections. It appoints the other half. And it appoints a mayor as a tie-breaker. So the women are being offered the opportunity to vote for 49% of the important decision-making posts. Moreover, the municipal elections are it. There are no provincial elections. 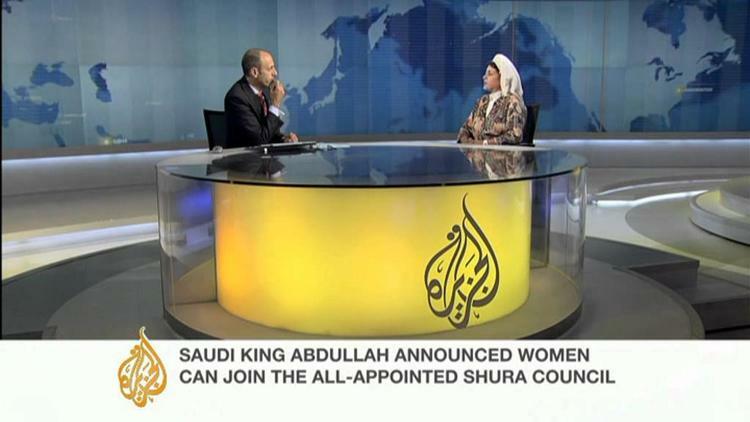 The national Shura Council (advisory body to the king) is appointed by the monarch, though now it can have women on it. At a time when Tunisians, Egyptians and Libyans are demanding free and fair, transparent parliamentary elections and the end of secret-police rule, the Saudi monarchy is taking not so much baby steps as embryonic ones. Elections to a national parliament or at least parliament-like advisory body had been scheduled for 2010, but they were never held. The royal family may be moving too slowly. Half the population is less than 25 years old. The country is 82 percent urban, and 79 percent literate (i.e. aside from the elderly, most people can read and write). Some 60 percent of university students are women. Relatively well-off middle classes in countries like Saudi Arabia frequently get up the courage to challenge the authoritarian character of their government. Saudi Arabia is ruled by a core of powerful princes led by the octogenarian king, but it has altogether some 7,000 princes. Inequality of wealth, high youth unemployment, allegations of corruption, and political repression have all contributed to subterranean discontent. Whether mollifying the half of the population that consists of women will be enough to forestall a growing movement of discontentment remains to be seen.